Your child will be the most popular kid in school with a few of these delicious treats packed in his or her lunch. Be sure to save a few for yourself—adults love them too! Preheat oven to 375°F (190°C). Place oven rack just above oven center. F.
In a large bowl, combine peanut butter, butter, sugar, brown sugar, egg and vanilla; beat with an electric mixer until light and fluffy. In another bowl, mix together flour, baking soda and salt. Stir into butter mixture until well blended. Shape dough into 1-inch balls. Place balls 3 inches apart on ungreased cookie sheets. Gently flatten each ball with fork in a criss-cross pattern. Bake in the top half of 375°F oven until lightly browned, 8 to 10 minutes. Remove cookies from sheets; cool on wire racks. Slice-N-Bake: Prepare dough as above but do not preheat oven until ready to bake. Roll dough into 10-inch log. Wrap in wax paper or plastic wrap and chill several hours until firm. Slice log into 1/4-inch slices and bake as above. Peanut Thumbprint Cookies: Prepare dough as above. Roll dough into 1-inch balls. Roll balls in beaten egg white and then into 1 cup finely chopped peanuts. Place on ungreased cookie sheets, 3 inches apart. Gently press thumb in center of each cookie. Bake as above. Press thumb gently in center of each cookie, while warm, if deeper indentation is desired. Place large chocolate chip or drop into center, or cool and fill with favorite jam. 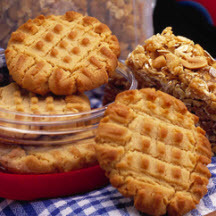 Recipe and photograph courtesy of the National Peanut Board.